*Total patient-years of follow-up were 958 for active TB and opportunistic infections and 955 for total malignancies. 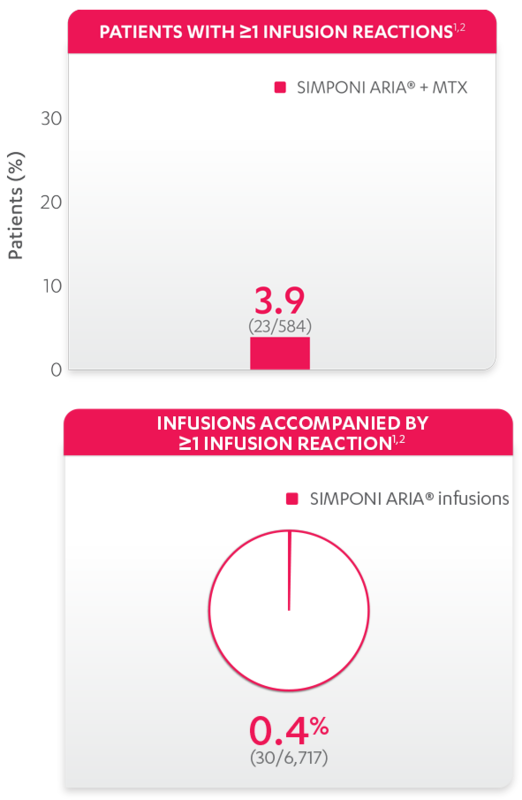 During the controlled and uncontrolled phase, 6 malignancies were reported in 5 patients treated with SIMPONI ARIA® + MTX. References: 1. Data on file. Janssen Biotech, Inc. 2. Bingham CO III, Mendelsohn AM, Kim L, et al. Arthritis Care Res (Hoboken). 2015;67(12):1627-1636. 3. SIMPONI ARIA® (golimumab) [Prescribing Information]. Horsham, PA: Janssen Biotech, Inc.